Online tickets are available at the link above until an hour before this event. Unless otherwise noted, tickets will continue to be available at the door. Francisco Márquez is originally from Venezuela. He received his MFA in poetry from New York University, where he was a Goldwater Fellow. The recipient of grants from the Saltonstall Foundation for the Arts, Bread Loaf Writer’s Conference, and Letras Latinas, his poems have been published in Bennington Review, Narrative, and The Offing, among other publications. He works at the Academy of American Poets and lives in Brooklyn, New York. Aldrin Valdez is a Pinoy writer and visual artist. They are the author of ESL or You Weren’t Here (Nightboat Books, 2018). 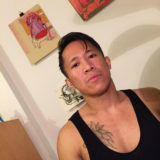 Aldrin has been awarded fellowships from Queer/Art/Mentorship & Poets House. 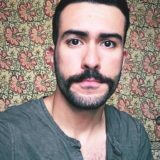 They currently curate the 2018/2019 winter season of the Segue Reading Series with fellow poet Joël Díaz.